Buddha Boy had a plan. He planned to walk across the street to McD's after dropping off his car for service. He planned to have a Big Breakfast with an extra order of sausage patty. Of course, when you involved the wife and the kid, the plan never went as planned. Since he asked, BabyE and I agreed to join him for breakfast, but not at McD's. 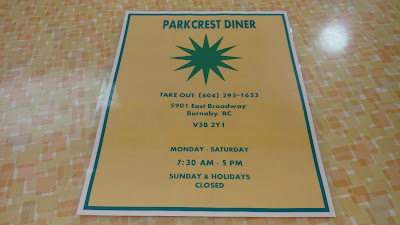 I drove my little cherry tomato (as my brother calls my little red car) and picked up Buddha Boy from the dealership before heading over to Park Crest Diner in the Parkcrest Shopping Centre on Broadway in Burnaby, just one block northeast of Lougheed Highway at Holdom Avenue. 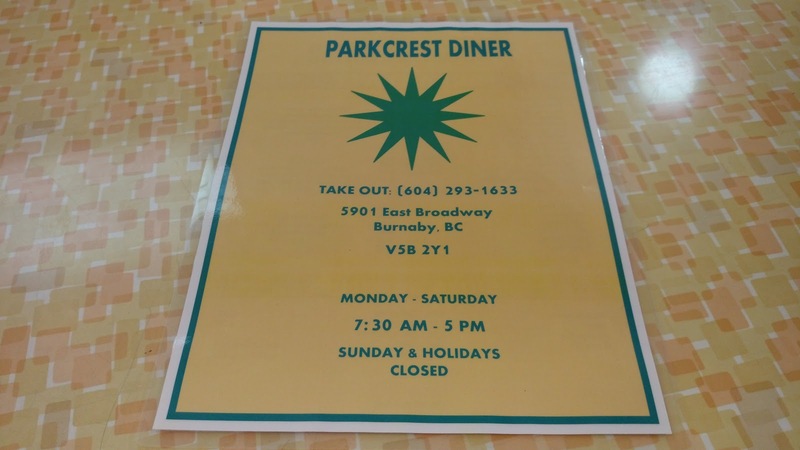 This little diner, located in the same plaza as Garlic & Chili Restaurant 蓬萊川魯菜館 and Buy-Low Foods, has been another one of my go-to lunch spot. Literally, this place is only minutes drive from my office. 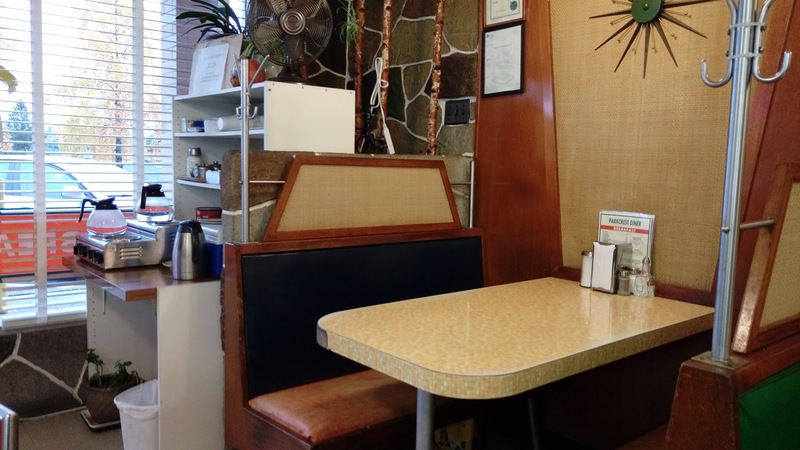 Buddha Boy had a Cafe Hash for $8.95CAD. 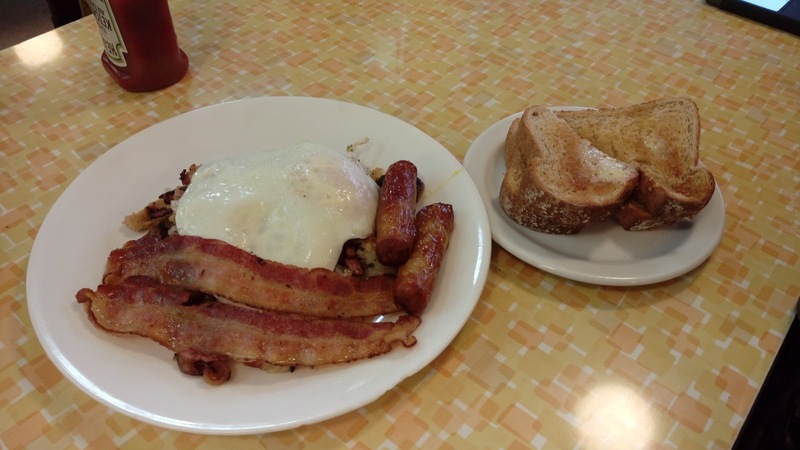 Side orders of bacon and sausages were added at $2.50CAD/order. The hash was a blend of sausage, bacon, ham, onions and mushrooms. This came with two eggs any style and two slices of toasts. 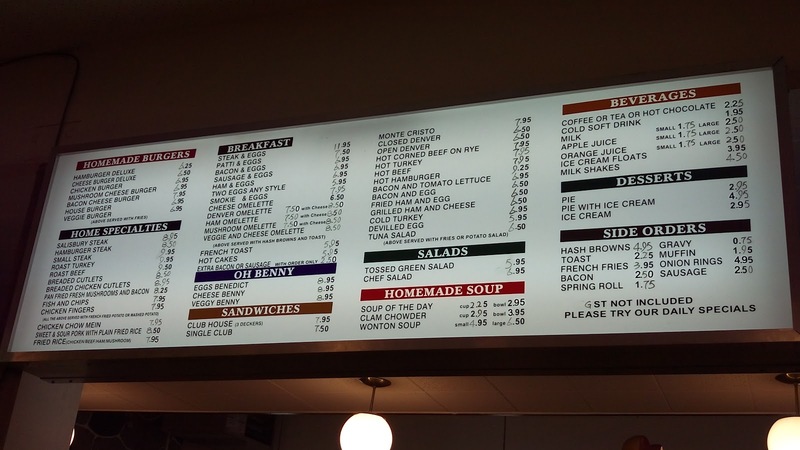 After adding a hot tea, Buddha Boy's breakfast was $16.20CAD. 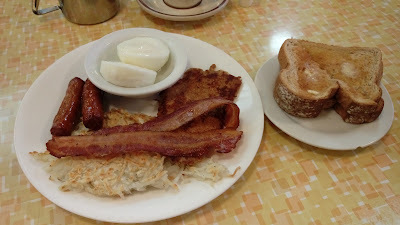 I also added side orders of bacon and sausages to my $7.95CAD plate of Pork Cutlets & Eggs, which consisted of two thin cutlets, two eggs any style, hashbrowns and two slices of toasts. After adding a morning cup of coffee, my meal was a loonie less than Buddha Boy's breakfast. Service was friendly and welcoming. Food delivery was timely. Hot water (for tea) and coffee were replenished promptly. Yes, I didn't really say much about the food. 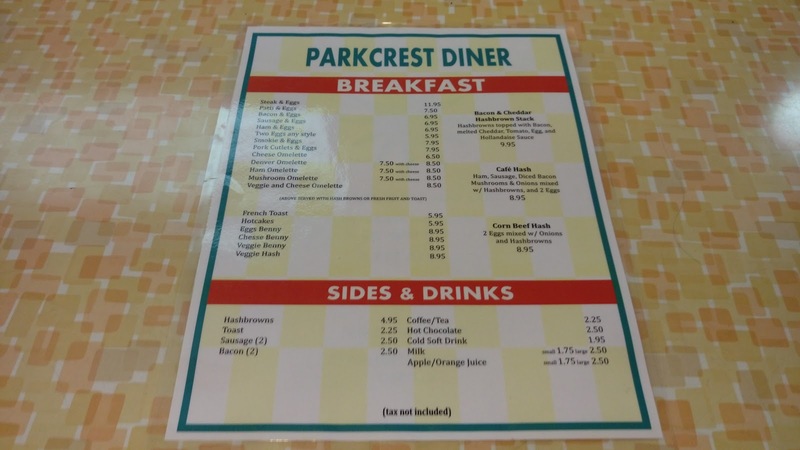 Honestly, with breakfast items as simple as what this diner offers, there's really not much to talk about since the quality was similar to what one can make at home. After all said and done, was this a worthy meal? Not for big eaters like us.